The last resolution we examined (before our brief break to discuss the rebuilding work of the cathedral in Haiti) dealt with our stewardship of our planet – …”this fragile earth, our island home (Eucharistic Prayer C, Book of Common Prayer).” And this is, indeed, a crucial part of our work as good stewards but it’s not all we are called to do! The 77th General Convention approved a resolution designed to encourage Steward Leaders in their roles within our congregations. I’d like to suggest we take it one step further: as all are called to minister through our Baptismal Covenant, this resolution is not just for those who lead the stewardship committees at our churches but it is for all of us! • Practice the basic principles of personal and corporate financial management leading to a healthy relationship with money as integral to our faith in God. • Build up and empower others in these expectations of steward leaders. • Gather and empower groups of people to inspire action around common missions and goals. 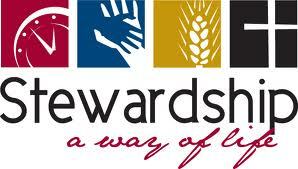 Imagine the difference in our stewardship campaigns if the whole congregation looked at stewardship through these eyes! Imagine the difference in our communities, if we each practiced stewardship of our time, talents and treasures with such an intentional focus! “What can I do?” you ask. Good question. You can share this with your pastor and the head of your stewardship campaign. You can share this with the head of your Christian Formation program for a discussion in your both your adult and children’s Sunday school classes. You can even share it with the publisher of your church newsletter – with a link to the blog, of course! And then, you can let us know what you and your congregations are doing to make stewardship a way of life and not just an annual campaign! Thanks for blogging about Stewardship, Judith! We’re going to be using the program “Lent 4.5” for our Lenten study at St. Michael’s this year. It’s a wonderful program with a focus on Stewardship of all creation. I’m really looking forward to it!